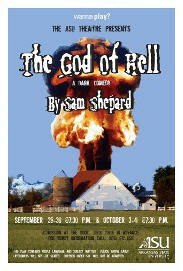 Sept. 22, 2006 -- The Arkansas State University Theatre will open the 2006-2007 Season on Friday Sept. 29, with The God of Hell, a dark comedy about subversive government plutonium testing. The show approaches the difficult theme with colorful humor and quirky characters that are guaranteed to keep audiences laughing. The God of Hell was written by the Pulitzer Prize winning author, Sam Shepard. The ASU Theatre’s production is under the direction of Bob Simpson, department of theatre chair and professor of theatre. Scenic design will be under the direction of Jeff McLaughlin, Assistant Professor of Theatre. Lighting design will be under the direction of Ashlee Wiseman, a senior theatre major from Searcy. Kelly Schaefer, assistant professor of theatre, will serve as costume designer. The cast includes sophomore theatre major Jeremy Bukausku of Memphis, as Frank; sophomore theatre major Whitney Elliott of Magnolia, as Emma; sophomore theatre major Jared Weston of Paragould, as Welch; and senior theatre major William Rowland of Jacksonville, as Haynes. Senior theatre major Sophia Barrett of Jonesboro, will serve as stage manager. The God of Hell will be performed at Fowler Center Sept. 29-30, Oct. 3-4 at 7:30 p.m. Tickets may be purchased for reserved seating in advance at the ASU Central Box Office in the Convocation Center or by calling 972-2781. Tickets are also available online at tickets.astate.edu. Reserved seating tickets may be purchased at the door on the evening of the performance. Ticket are $10or $8 in advance. This play contains adult language and subject matter. Children under six years old will not be admitted. For more information contact Bob Simpson (870) 972-2037.